Nobel Prize Ceremony. Paul Romer (@paulromer) via Twitter. This year's lecture features Nobel Prize-Winning Economist Paul Romer. CAPACITY FOR THIS EVENT HAS BEEN REACHED. SINCE THERE ARE ALWAYS NO-SHOWS, WE ENCOURAGE YOU TO COME ON THE DAY OF THE EVENT. THERE WILL BE A STAND-BY LINE AND ALL REMAINING SEATS WILL BE GIVEN OUT AT 5:20 PM. Nobel Laureate Paul Romer, an economist and policy entrepreneur, is co-recipient of the 2018 Nobel Prize in Economic Sciences, the Founding Director of the Marron Institute of Urban Management at NYU, and Professor of Economics at NYU. 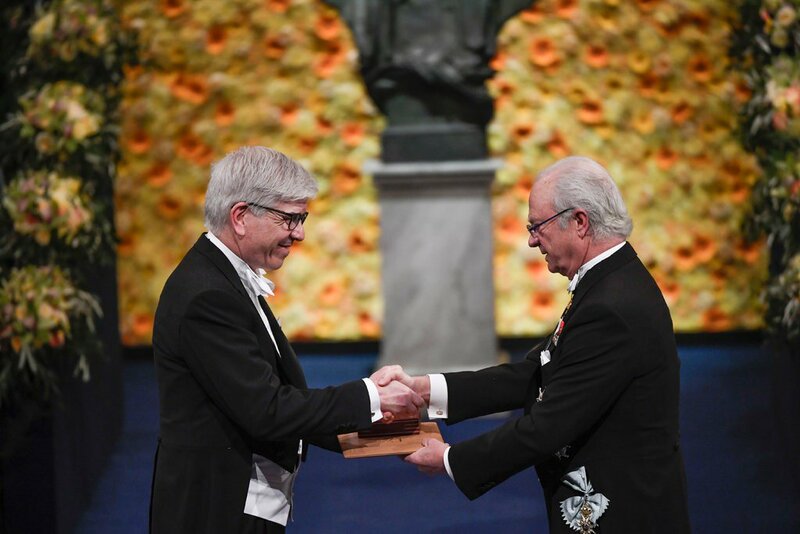 Professor Romer received the Nobel Prize in Economic Sciences for his work in "integrating technological innovations into long-run macroeconomic analysis." Before coming to NYU, Professor Romer taught at Stanford University's Graduate School of Business. While there, he took an entrepreneurial detour to start Aplia, an education technology company dedicated to increasing student effort and classroom engagement. To date, students have submitted more than 2 billion answers to homework problems on the Aplia website. Prior to Stanford, Professor Romer taught in the economics departments of the University of California, Berkeley, the University of Chicago, and the University of Rochester. He is currently a Research Associate at the National Bureau of Economic Research, a Fellow of the American Academy of Arts and Sciences, and a non-resident scholar at Macdonald-Laurier Institute in Ottawa, Ontario. In 2002, he received the Recktenwald Prize for his work on the role of ideas in sustainable economic growth. Professor Romer earned a B.S. in mathematics from the University of Chicago. He earned a Ph.D. in economics from the University of Chicago after completing graduate work at the Massachusetts Institute of Technology and Queens University. Paul Romer's 2011 Ted Talk: "The world's first charter city?" Paul Romer's 2009 Ted Talk: "Why the world needs charter cities"
Please note that your RSVP does not guarantee admission to this event. We encourage you to arrive early to claim your seat. Any remaining seats will be released to the stand-by line at 4:50pm. No food or drinks (with the exception of water) are allowed in the venue. Please do not bring bulky items such as backpacks or large umbrellas. For guests with a Disabled Person Parking Placard or License Plate, please purchase a Disabled Parking Permit for $9 (cash only) at the Kiosk in Parking Lot 4 on Westwood Plaza and Sunset Blvd. The parking attendant will then direct you to Parking Lot 5 (Accessible Parking Only). Please check our website for last minute updates or changes. Established in 1997, the Arnold C. Harberger Distinguished Lecture on Economic Development celebrates Arnold Harberger as an eminent scholar and teacher. The lectures provide a special forum for outstanding students of international economics and policy to present their views and research to the UCLA community and the public.